That’s the name of a sweet little venue that is popping up this weekend over at the Johnson Mill in Johnson, AR (between Springdale and Fayetteville.) 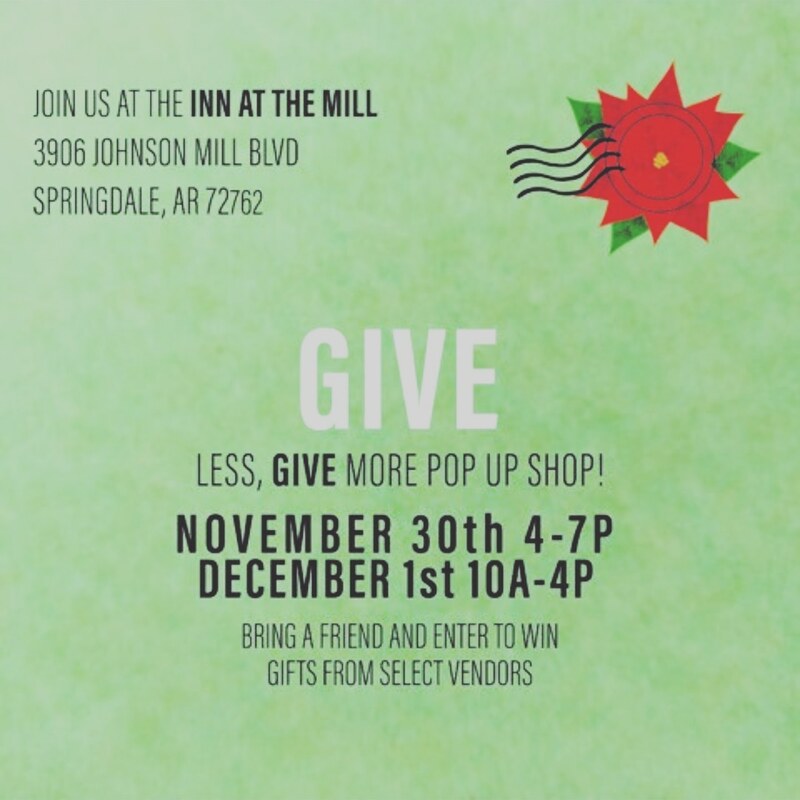 Give Less, Give More is hosted by Good Acres Life, a local company owned by Mariette Spedale. I’ll be there with my latest collection of Paleo Paints and a bunch of prints and stickers made from my original Ozark earth colored paintings. You can find out more about the Soul of the Ozarks Collection No. 4 at my Paleo Paints blog. I just made a post that tells about each color and what rock or source it came from. These are the colors and sources for Collection No. 4 in the Soul of the Ozarks Wild Ozark Paleo Paints. At the same venue there will be other makers and holistic healthy kinds of business owners to visit. The weather forecast calls for rain Friday night, but I think it’ll arrive later than 7 pm, when our event ends for the evening. Saturday is supposed to be brilliant weather. So What is the Meaning of “Give Less, Give More”? I’m not sure, but here’s my interpretation. Rather than give a lot of inexpensive items that most often find their way to the neglected corner of a stash in someone’s closet somewhere, give them something that may cost a little more but delivers far more in value. My paints are not inexpensive. The set of 6 colors above will cost $55. But it’s the sort of gift that will definitely be used and appreciated by anyone who loves nature and likes to paint with watercolors. These colors aren’t going to be on the shelf at your local art supply store. These are Ozark colors, reflecting the very soul of these mountains. So, if all give is this one gift, it will mean more than giving lots of other little things that might add up to the same bottom line. How would you interpret the meaning of that phrase? I’ll have prints in 8 x 10 and 5 x 7, note cards, and stickers with these images. And I’ll have five sets of the Collection No. 4. Fox No. 1 “Little Rascal”, all Ozark pigments.